This compact radio control has two channels. Channel 1 is controlled by wheel, channel 2 is controlled by trigger. Wheel can be easily detached if only trigger control is needed. Important note on pairing. Place binding on channel 4 before turning on the receiver. Turn on the receiver. 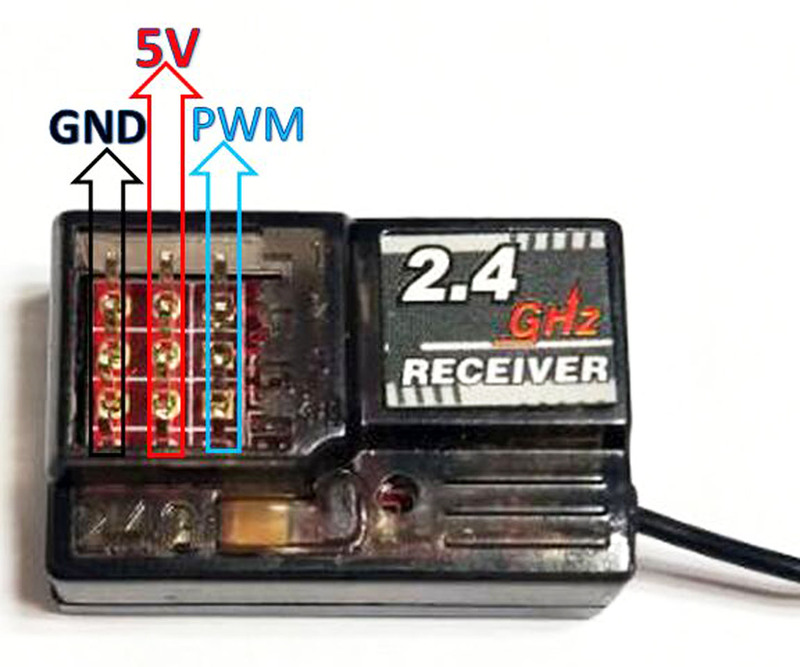 Press and hold the pairing button of your transmitter first then turn on its power switch. Stay pressing on the pairing button until receiver's LED stops flashing. When LED turns solid on (no flashing), the pairing is complete. Remove the binding from the receiver. This RC works with Dimension Engineering's motor drivers. SyRen: Set to auto-calibrate so driver will detect and calibrate based on the PWM signals generated by the RC's receiver. 3 pins connect to channel 1 to use the wheel control, channel 2 to use the trigger control. Sabertooth: Set to auto-calibrate. Set to mixed mode. Channel 1's PWM to S1 and motor to M1A and M1B. Channel 2's PWM to S2 and motor to M2A and M2B. That way, the wheel controls the steering, the trigger controls reverse/forward.